Though Baroo opened in late 2015, this was definitely the year the restaurant broke: the tiny spot, which concentrates on palate-popping dishes that taste, well, like nothing you've ever had thanks to fermented seaweed and fruits and outsider grains like Job's tears, was anointed one of Bon Appetit's best restaurants in the US this year, just one among a number of accolades that have made the strip-mall spot a must-visit destination for any LA food tourist. 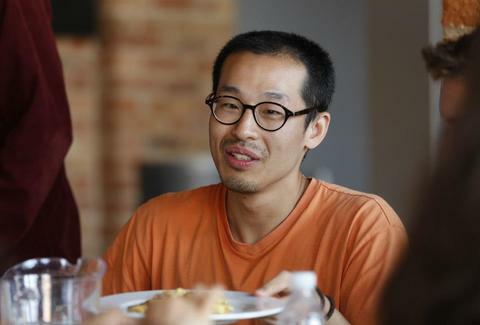 Chef Kwang Uh answered our questions via email, which we've edited with his permission for clarity; he waxes philosophically about critical recognition, how incredible this year was for him, and what's next for him and his partner Matthew Kim. Kwang Uh: The speed of time in 2016 flew relatively faster than any other year, which was due to the tons of work, attentions, and recognition we got this year. We can feel it as if we space-traveled for six months but the real time spent was a year. It was busy -- we were living in a dream, totally unexpected, and unbelievable. Both personally and professionally, absolutely I'm so so so grateful and appreciative, and at the same time asking myself questions like "Is it real? These rewards, this attention? Are you qualified for this something like that?" So personally this year was a really important life lesson that cannot be purchased: take time to know, have an insight, and take a look & reflect more objectively -- also professionally it was time to think about the true color of self, cuisine, style, and what I am doing now. This has been a pretty unbelievable year for you -- what was the most unbelievable moment? Uh: The most unbelievable moment was a dream came true: opening a restaurant outside of my country. It was a lifetime achievement goal as well as a dream. From that, every moment, attention, and achievement are pretty much most unbelievable to us and we cannot judge or grade which one is best. Uh: A few months before this happened, I'd sent some recipes with some answers on the questions regarding the recipes, at Baroo while we were traveling and had shut Baroo down. We realized it was pretty intense and serious and [they had put a lot of time and money in it], for example, for the photo shoot, photographers flew from Canada. When the time came around to be on the list actually, someone I know tipped us off on the possibility, but it was still unbelievable: yeah, life is a dream, and dream is a life. What's your favorite part of the dining scene in LA? Uh: [The city is a] melting pot. People are eager, and trying to open restaurants of every possible cuisine since the professions of people place them in arts, fashion, and entertainment. [The city is also home to a] sort of freestyle, and post hippie-ish & eco green lifestyle; and all of these characteristics factor into culture, style and cuisine tremendously. Also absolutely, the fresh high-quality produce almost spoils California with various varieties [of fruits and vegetables]. Uh: Just to let it be, and flow, then go with it harmoniously, is sort of the ideal goal to us. I will be staying at a Buddhist temple in the southern part of Korea, in a mountain -- a very remote area from the city, with a master temple cuisine Buddhist monk, as a temple stay -- practicing, learning, going back to the life of pupil, starting again, reflecting to find the way to live, and stay sane and be a better human being. Jeff Miller is really hoping for a Baroo No. 2 in 2017. He's at @jeffmillerla on Instagram and @ThrillistLA on Twitter.